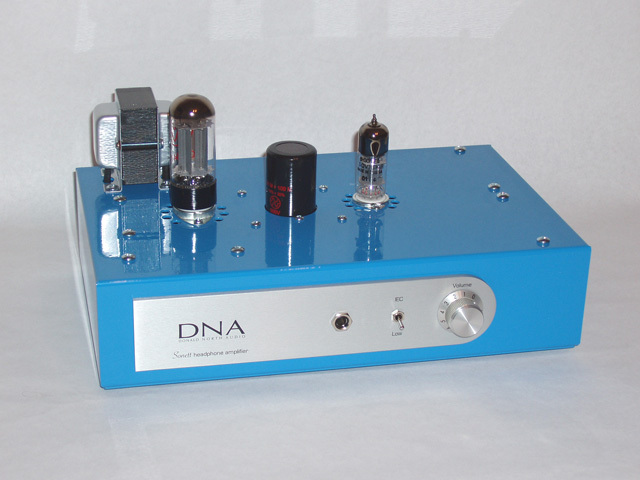 I just picked up a DNA Sonett headphone amplifier. I first heard it at a headphone trade show last year and was extremely impressed. I currently have it hooked up at my workstation and being fed by a Neko Audio D100 Mk2 DAC. The higher output voltage of the Mk2 is necessary because the Sonett's gain is limited; I usually have it set to a volume level around 4 out of 10. I'm using AKG K 702 headphones. The Sonett is a class A triode design and the first piece of tube gear I've owned. The nicest thing about it is the lack of obvious and subtle smearing so music is quick, accurate, and I can hear more of what I'm supposed to. This is partially due to the zero-feedback design. It also has absolutely no noise floor. The D100 has no audible noise floor either, and so the music is the only thing you hear. Another interesting feature of the Sonett is the ability to switch its output impedance from 28 ohms to 120 ohms which matches the IEC 61938 specification. The HeadWize Headphone FAQ mentions this, and in particular says well designed headphones should have a fairly flat impedance curve. In that case, the higher 120 ohm output impedance shouldn't result in a difference in the frequency response. The AKG K 702 sounds pretty much the same with either output impedance setting, which implies its impedance curve is basically flat and thus "well designed" according to that FAQ. This comes up every once in a while during conversation, so I thought I'd make sure not to forget it anymore. I wrote this haiku as part of a contest run by Audioholics and won a 1000' of 14/4 Class 2 in-wall speaker wire from Impact Acoustics. While visiting various audio boutique shops a while back, originally to audition some amplifiers, I happened across a stellar setup at Audible Arts. A large room with decent acoustics was running a pair of Analysis Audio full range ribbons, driven by a VTL TL-7.5 and Spectron Musician III Mk2 amplifier. The Analysis Audio speakers need an amp like the Spectron because their impedance drops so incredibly low. I was using my Neko Audio D100 DAC for the source. There was a very specific sweet spot, but it sounded amazing. Hearing this setup sold me on full-range planars without an enclosure (i.e. dipole). Not because I wanted the rear wave, but because they are just so quick and the smear goes away. Of course the electronics need to be free of smearing as well, but with planars the whole boxy sound goes away and everything is incredibly crisp and tight. I have had some experience with ribbon and planar audio technology since I have Onix Reference 3 and Strata Mini speakers. But a real dipole planar was just so much more impressive. I'd originally picked the Reference 3 in part because I wanted a ribbon tweeter, and that was a nice improvement over other tweeters I had heard. But this was no comparison. I started shopping around to see what sort of planars would work for me, given my budget. I listened to some Martin Logan speakers but was disappointed by the lack of bass control. 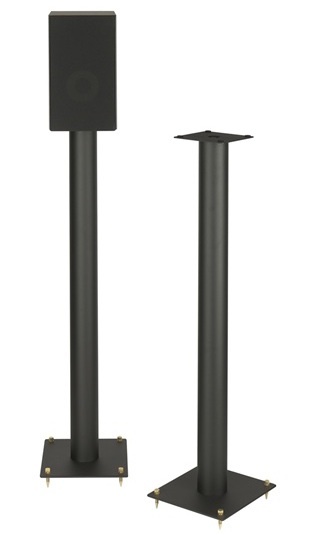 Except for the CLX, the Martin Logan speakers incorporate a cone driver for the low frequencies. The integration at the crossover point didn't impress me, and I did not hear the tight control I had heard with the Analysis Audio speakers. They were being driven by Pioneer's flagship receiver, so that may have had something to do with it. Then I stopped by The New Audible Difference to check out the Magnepan line. I listened to the 12, 1.6, and 3.6. This was a sound that I loved. I decided then and there that this is the speaker I wanted to get. The Magnepan sound quality was very close to the Analysis Audio ribbons, and much more affordable. :) I also felt the Magnepan off-axis behavior was slightly better than the Analysis Audio speakers, which would make things a bit more enjoyable. There was a significant difference between the 12 and 1.6 in large part due to the different height. The 12's made everything sound like they were coming from some point near the floor, while the 1.6 and 3.6 presented a better height. I didn't feel there was much difference between the 1.6 and 3.6, and in truth after speaking to Magnepan I decided I could not run the 3.6 speakers because I would risk damage from my subwoofers. After setting things up at home, I am extremely happy. As I mentioned earlier, I was not particularly interested in the rear wave acoustic signature, and I like the sound much more without it. So I've placed acoustic panels almost immediately behind them to absorb the rear wave. I am using the Magnepans with my subwoofers and an 80Hz crossover. The Magnepan speakers won't play very loud due to their low sensitivity and physical limitations, and of course they do not extend as low as my subs. But the integration is extremely good. There's no way I could run Magnepan speakers for home theater, but for music they're absolutely wonderful. I picked up a pair of Rosewood AV123 Strata Mini speakers at the end of last year because they were having a special and the price was too good to pass up. After reading spectacular reviews and lots of good things, I've been wanting to get these speakers for about a year, possibly a little longer. I replaced my Castle Avon speakers with these hybrids, and the first thing Luna said after hooking them up was that the sound was so much clearer and she could understand what people were saying a lot better. The Minis have a ribbon tweeter, planar magnetic mid-range, and a rear woofer. They're rear ported. Specifications list them as going down to around 27Hz, which probably means the usable low point is around 40Hz. I have to place them close to the wall anyway, so there's a lot of bass reinforcement&emdash;kind of sloppy and boomy as the bedroom isn't well treated. They're certainly better than the Castle Avons, but not as good as the Onix Reference 3 speakers. The planar magnetic mid-range doesn't seem much quicker or cleaner than the Ref 3 mid-range, although I suspect there is less boxy sound if you turn up the volume; the Ref 3's will start sounding boxy if you turn them up. The ribbon tweeter is excellent though. And very sensitive to placement because moving up and down or side-to-side the tweeter response falls off quickly. I am not using the front spikes so that the front plane is perpendicular to the floor and the tweeters aim at my head. I'm sitting slightly off-axis, as the high frequency response rises a bit more than it should when on-axis. Overall, I'm very pleased with the Strata Minis in my second setup, and really like their sound. I've been waiting on this review until after I could get some better gear to drive them. I'm now using a Parasound Halo P3 pre-amp and Halo A23 amp, along with my prototype DAC. The DAC and amp made a huge difference. Unfortunately I feel as though the P3 adds a little bit of veil across the entire spectrum. Things sound much better if I connect the DAC directly to the A23, but then there's no volume control. Since this is my second system, I can live with the pre-amp. A short while ago I mentioned how watching THGttG popped my subwoofer grilles and a desire to do something about it. So over the weekend I increased the leg length of the subwoofer base to 4" (I would have gone with 5" except Home Depot doesn't sell screws longer than 6") and created new end plates and legs for the top of the subwoofer as well. There are no longer any grilles in use. Increasing the leg length to 4" is based on allowing enough cylindrical surface area for the air displaced by the driver to freely move back and forth. It might have been ideal to go with 5" legs but that would have required 7" screws. As it is, the 6" screws only came with hex heads and required me to cut a little depression into the plates for the head to run flush with the plate surface. The top plate provides protection for the driver in a sturdier and more reliable manner than the grilles and allows the driver to reach its xmax without any interference. The grilles were impeding the surrounds. I do think it looked better with grilles though. High-energy excitement. That's how I would explain the contemporary film adaptation of The Hitchhiker's Guide to the Galaxy. Unlike the earlier BBC attempt, which may go down in history as one of the most disappointing adaptations of all time, this version comes with good actors, a good screenplay, and the budget and production quality this book deserves. Complete with rodent overlords. The movie captures very well the characters created by Douglas Adams. 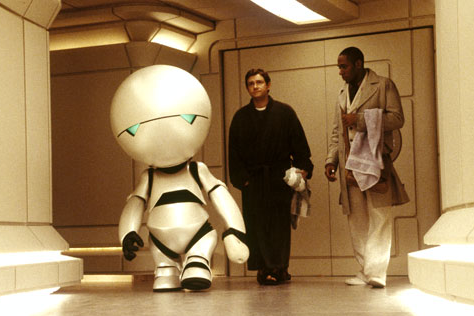 I thought the actor choices were apt, especially for Marvin who truly comes across as a depressed robot. Alan Rickman is just the perfect voice for that role. The only thing I found a little disappointing was the way Zephod's twin heads was done. It's certainly a lot better than a fake rubber head perched on the actor's shoulder, but it didn't play that much of a role in the film; you could have simply ignored that aspect of his character for the most part. I did feel a little weird that the story and plot elements of the film didn't match up with how I remembered the book, and Wikipedia points out that I wasn't just imagining things. I think the movie is very good, but I wonder if I would have liked it better if it held closer to the original story. It's hard to say, because on its own this version of the movie is very strong. THGttG is considered an excellent subwoofer test, and I have to agree. The sound production is great. Very immersive and unique with great sound effects that are fun but fit right in. And completely full spectrum without holding anything back. The grilles on the top of my subwoofers got pushed off by the driver excursion which tells me this is the first movie that has actually driving my subs close to their limit. I plan to address that problem soon. I'm sure real fans of Douglas Adams works are going to find a number of nits to pick about the movie, but I really enjoyed it and would watch it again. I won a 20% off coupon several weeks ago and used it recently to purchase a pair of StudioTech SP-36 speaker stands. I replaced the 30" tall Plateau speaker stands I was using for the two surround speakers with these stands, which are 36" in height. With the Plateau stands, I had a cinder block underneath to raise the speaker over the top of the couch. Overall build quality of the StudioTech stands is superior, and the base plate and top plate both seem denser. The pillar itself also seems to be stronger. Although hollow to allow sand or shot filling, the ends are capped off which acts a little like an additional brace. The foam pads that are included with the SP series stands are also a little thicker. I do have two complaints about the SP stands though. The first is the wire clips. They actually have a very nice clipping mechanism that lets you push the wire into it, causing the clip to close and grip the cable. However, the only method of attaching those clips onto the stand is by its sticky backing. This backing really isn't very strong, so my 14/4 speaker cable keeps pulling it off. My second complaint is the single screw used to attach the plates to the pillar. With only a single screw in the center, you cannot easily align the top plate and the bottom plate with each other. This makes it a lot harder to align the speaker with the bottom plate and floor. On the other hand, this does allow you to toe-in the speaker without toe-in of the stand, which might look better. The stands do need to be filled to increase their weight, mostly for safety's sake. Otherwise it is easier to tip over the speaker and stand. I looked for some lead or steel shot, but about the only place to purchase it in large quantities is off eBay. 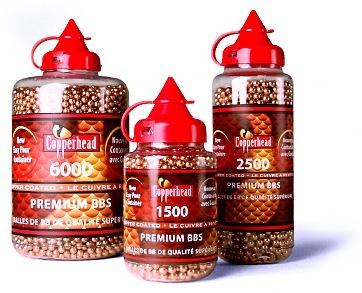 Instead, I ended up getting eight bottles of Crosman Copperhead BBs. Each bottle is about 4.5 pounds, and exactly the diameter of the speaker stand pillar. I think you could fill the pillars up with eight bottles each, but in my case I put four bottles in each pillar. The BBs were are more cost-effective than actual shot, but I haven't calculated if they're actually lead or not. I was lucky enough to win one of the gracious prizes given out this past holiday season by Secrets, a Rocket UFW-12 subwoofer. This is a 12" sealed design in an enclosure with internal volume somewhere around 4.5ft3. It's powered by a 1000W RMS plate amplifier that includes one band of parametric EQ, and is veneered in South American Rosewood with piano black top and bottom caps. It also weighs 137 pounds. I replaced the Velodyne SPL-1200 Series II subwoofer I was using upstairs with the UFW-12. This is sort of a horizontal upgrade, rather than a vertical one. The reason I consider this more of a horizontal upgrade is because while I think the UFW-12 provides better performance than the SPL-1200 Series II, it also includes a 23Hz, 10th order subsonic filter. I believe the SPL-1200 Series II incorporates a slightly lower filter, possibly set around 20Hz. The difference in frequency response can be seen in the Secrets UFW-12 measurements and a brief statement in the Audioholics SPL-1200 Series II conclusion. So you get better performance above 25Hz and one band of PEQ with the UFW-12, but the SPL-1200 Series II goes a little lower. Irrespective of the above, the UFW-12 performs excellently from 25Hz and up. It seems to reproduce sounds with more authority than the SPL-1200 Series II, although perhaps they are fairly equal in terms of distortion and maximum SPL. Certain low frequency sounds simply sounded better and clearer with the UFW-12. But the difference in low frequency extension can be audible. I found my in-room response matched very closely the measurements at Secrets, although with some peaks and dips due to the room. The included PEQ may help tame a peak if you have a large one, but you need closer to five or seven bands to produce a really flat response in most rooms. Having to select the center frequency, Q, and amplitude via analog dials means you do have to go through some trial and error to get your desired filter set up. I used the PEQ to fix one of the 5dB boost, but overall the response was very good even without EQ and it would have been good even without that filter. Overall, I find the UFW-12 to be a good subwoofer for its current duty, which is as part of our secondary system used for video games. I would not, however, be satisfied with it or even a pair of them in our home theater setup. This is mostly for cutting out so quickly around 25Hz, because above there I think the performance is excellent as long as you have enough of them to meet your SPL requirements without distortion or compression. I think for most music the UFW-12 would be an excellent choice, but you need something that goes lower if you enjoy large drums, pipe organs, or electronic music with deep bass lines. Cosmetically, the UFW-12 is beautiful. It's also large and could be used as a low end table if you wished. The only drawback is it makes the Castle Avon speakers look too small. A couple of years ago, Kris Deering wrote a glowing review of Onix Reference 3 speakers. Since then, I've seriously considered them as my ideal upgrade step, in part because at Internet-direct pricing they provide a lot more value than anything else. I've just completed that upgrade with excellent results. Our theater now runs Onix Reference 3 for mains, Onix Reference 100 for the center, and Onix Reference 1 for the surrounds. In comparision to the Onix Reference 1 (read my impressions), the Onix Reference 3 has better very high frequency reproduction, better off-axis response, and feels less dry to me without losing any of its accuracy. The Ref 3's happened to arrive in the middle of a smoke alarm sequence and the alarm sounded more realistic on the Ref 3 than the Ref 1. I feel the Ref 3 audio reproduction is slightly better, probably due to the smaller operating range of the two woofers. That may be why the sound was less dry. I have also set the Ref 3 crossover at 50Hz, although 40Hz was a close contender and in other rooms I'm sure you could look at a 30Hz crossover. In comparison, the Ref 100 crossover point is 70Hz which is also close to where you can set the Ref 1 crossover. I try to avoid using ports because of the issues with group delay and in my room ports don't contribute much at these high frequencies. I've only experienced rear-ported speakers in this room. I did some non-blind subjective comparisons of tweeter response with and without the grilles using one of the early scenes in Moulin Rouge where they're first rehearshing Spectacular, Spectacular. There are some strange high frequency sounds there and at this scene I found the very high frequency reproduction to be slightly attenuated with the grilles on. My non-blind grilles on/off tests on anything below may have revealed a slight difference but I can't be sure. I am fairly sure on the very high frequencies as without the grilles my ears felt a little harsh. I have since removed all grilles from all of the speakers. The Ref 3 and Ref 100 reproduce the vocal range extremely well. It is much easier to distinguish and also identify in the first place when there are multiple voices singing together. This can be heard on any music tracks that involve a backup singer who was put in to add body or character to the primary singer, and also in Moulin Rouge where many of the pieces are sung in chorus. Cabinet resonance is very good although not completely inert at normal volumes. I was a little worried that the Ref 100 would not match as well with the Ref 3, but the timbre is pretty much perfect so far as I can tell so far. The Ref 100 may be a tiny bit off from the Ref 3 and closer to the Ref 1, but I have only heard that phenomenon a few times and it may have been due to Dolby Pro Logic decoding. Using Dolby Pro Logic IIx decoding removed that symptom. I was also a little concerned about the MTM design of the Ref 100 over a WMTW design, but it doesn't seem to be an issue after all. It was definitely an issue with the Monitor Audio Silver SLCR center chanel; the SLCR sounded closer to the Monitor Audio Silver S8 when positioned vertically instead of horizontally. Overall, the Ref 3 provides very accurate audio reproduction across its entire operating range including over the very high and low frequency bands, great off-axis response, and a seamless soundstage. My recommendation is to remove the grilles but you'd be hard pressed to consider it a real issue when the grilles are on. I had some trouble with software installation on Mac OS X when using a user account that has its home directories NFS mounted. This user is also not in the group that allows administration, so the software was actually installed as a different user. Basically, the software would just quit or sit there doing nothing without crashing or any messages at all, after it started up. So I ended up having to install and run the software as the non-NFS mounted user that also has administrator privileges. But once that was done, it was very easy. They've got a huge database of devices, including the GameCube, PlayStation 2, Sony STR-DE597 receiver, Panasonic PT50LC13 television, Impact Acoustics 3-Play, and Dish 381 set-top box. So I didn't have to make the remote learn anything manually. I even gained remote on/off access to the PlayStation 2, which doesn't come with a remote by default. Now things are very nice with four macros: PlayStation 2, GameCube, Watch TV, Listen to CD. It works extremely well and I just hit one of the macros to start up the components and set their inputs/settings automatically, and everything's running. Even though I didn't do any heavy customization, the software does allow for it. You can assign different functions to different buttons in any of the modes. And if you choose not to use macros, you can still access devices directly by pressing the Devices button on the remote. In my quest for the ultimate subwoofer (restriction being no infinite baffle) flat to 5Hz, I purchased four 15" TC-2000 single voice coil drivers. After going through WinISD Pro and forums and gathering information and advice from many sources over a few months, these are the drivers I ended up with and the enclosure design would be to use sonotubes. I decided to use a sealed enclosure rather than a ported one because the port volume would be too great and a passive radiator would have too much group delay and somewhat extreme mass requirements for reaching 5Hz. I've put up photos of the construction process. The sonotubes are approximately 4' in length, and 20" in diameter. Each endcap is three layers of 3/4" MDF, with two layers inside and one layer outside. Having three layers for the endcaps posted a problem because you cannot purchase binding posts long enough to go through that far. So what I did is run brass bolts in from the inside to meet with short binding posts run in from the outside. The end caps, dowels, and protective grille over the top driver brings the total height of each subwoofer to approximately 4.5'. Most people cover their sonotubes with a black fabric "sock". I wanted something that would look a little nicer, so I covered mine with cherry veneer. Unfortunately, due to bumps in the outside of the tubes, there are some ridges in the veneer. And Alla and I had some issues with the glue, so there are some glue marks on the outside near one of the endcaps. We also had glue on our hands for a few days afterwards. So overall the finished look is not commercial quality when seen up close, but from a distance they look very nice. The project as a whole took a few weekends to complete. A lot of time was spent waiting on the endcap paint to dry, and sand, and recoat. I purchased a high quality mask to protect myself while cutting the MDF, as MDF creates a very fine sawdust when it is cut, and contains carcinogens. It's really best to cut MDF outside in the open air, rather than in the garage. I wish I'd found and purchased a larger circle jig though, because my makeshift one was not perfectly accurate. I am driving the finished subwoofers with a Behringer EP2500 subwoofer and giving it low-pass boost and equalization to mimic a Linkwitz-Transform using a Behringer DCX2496. You can accomplish the same thing with a cheaper unit, but the DCX2496 provides some additional flexibility. The cables were cut from a spool of Impact Acoustics 14/4 (four runs of 14awg in the sleeve) I won in a contest a while back. I'm doubling up the runs so the signal path is 14/2 each. Each channel of the EP2500 is driving two drivers in parallel, for a ~2Ω load. Using a Behringer ECM8000 microphone with an M-Audio MobilePre, I calibrated and equalized the subwoofer response flat down to somewhere below 5Hz, possibly even 2Hz, because of room gain benefits. The subwoofer can be driven to reference levels without clipping. At reference levels, it's a tiny bit noticeable. It's possible to increase the low-pass filter to boost those frequencies several more dB, in which case it really feels like there is a rotor passing over you. I'm not really sure what the dB level is supposed to be; 0dB implies 115dB to me, which I don't necessarily think I can reach at 5Hz, but at ~105dB it's already vibrating the entire house. The whole movie plays way loud at reference levels though, since it's all gunshots and explosions. So I purchased a Behringer EP2500 and also a Behringer DCX2496. The EP2500 is rated at 9.7A, and the DCX2496 pulls approximately 12W. I'm assuming the 12W off a 120V line equals 0.1A. Grand total is 9.8A. However, the problem is both of these units do not have a trigger. You turn them on and then leave them on. I don't really want to do that since most of the time the home theater is off. There are some Xantech products that can help deal with this, but they're expensive. The cheap DIY solution is a relay switch. One of my coworkers, Po Chiu, has a strong EE background. So I asked him if he knows that sort of box I need to build this 12V trigger so that when my processor turns on the AC outlet turns on as well. He explained the different types of switches to me. From there I found an article called How To Power Your MAME Cabinet. There are very simple instructions on that site for building your own relay switch. So I went to OSH and Radio Shack and picked up about $20 in parts. With a wire stripper and soldering iron I was able to throw everything together in about 20 minutes. End result is a 12V trigger from my processor that will turn on a pair of regular AC outlets to power on the EP2500 and DCX2496. The 16awg wire is only rated at 13A, and the DPDT relay is only rated 10A, but that's good enough to meet the 9.8A required by the EP2500 and DCX2496. Assuming those are the maximum current draw numbers, and not just nominal numbers. I picked up some 20" diameter Sonotube round concrete forms, in 4' lengths, from Westside Concrete Materials today. They are one of the few concrete supply companies in the area that is open on Saturday, although they're only open for a few hours. I'd originally tried arranging for purchase and delivery with Muller Construction Supply, but after two days where they twice promised to return my call but did not, I decided to look for a different supplier. The two guys I talked to at Westside were very friendly and helpful, and I was able to fit both sections in the Beetle although it was a tight fit. I'm going to use these round forms for the enclosures of the subwoofers I am going to be building over the next couple of months. Sonotube, or one of the comparable products made by other companies, provides a rigid enclosure without extensive bracing or many layers of MDF. MDF is very heavy, and requires you to build a box, so it's a lot of effort to build something that then becomes very hard to move around. The downsides to Sonotube are that you can only place drivers or anything else at the ends, and it has to be round or you don't get the rigid behavior. TC Sounds is having a sale on some of their drivers for a limited time, and since I'm trying to replace my 16-46PC+ subwoofers with something that will go lower, faster, and cleaner, I picked up some 15" TC-2000 drivers. So a poster at Secrets of Home Theater and High Fidelity asked for speaker recommendations in the sub-$3000 range. I originally suggested he go and listen to a bunch of speakers, but he's interested in getting some more brand names under consideration, I guess. So I replied again with some of my speaker impressions. I've decided to copy that portion of my second reply into my blog. For myself, I have Monitor Audio Silver S8/LCR/Sfx 7.1 for my home theater. They are overall a little warm, and have some cabinet resonances. The LCR isn't superb, but it's okay. The S8's aren't as precise in sound reproduction as I'd like (maybe cabinet resonances or just the drivers) but they sound pretty good overall. The Sfx speakers are okay. All of them roll off more than I like as they approach 20kHz. However, all of my friends are not audio enthusiasts so everything sounds exceptional to them. I also have Castle Avon speakers, graciously given to me by JJ, which I also enjoy. Their cabinet build is a better than the S8s, so there is less resonance. But there are only two drivers, the tweeter is located a little low (which is okay because of how I listen to them with my head kind of low) so normally would need stands, and doesn't have as good off-axis response as the S8's, I think. But because of how I use them, that doesn't really matter. When I auditioned the S8's a few years ago, I also listened to Klipsch speakers in the same room. They seemed too bright and harsh for me. Possibly the horn design being a bad choice in my price range. Possibly the tweeter construction. However others think those Klipsch speakers are perfect for them. 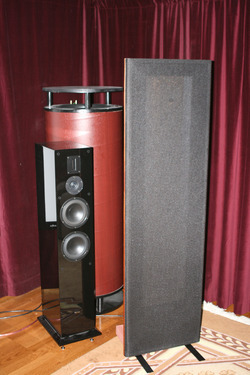 I listened to some B&W 805 (I think) speakers about a year or so ago at a boutique store. They were nice, and did the job very well. I don't have a lot of opinion on them though, as I didn't spend a lot of time listening and was mostly interested at that time in finding an amplifier. I also helped a friend set up a Hsu VT-12 system. For the money, they are a great deal, but noticeably lower in quality than the other speakers I've mentioned. Especially at high volumes. The sound isn't as realistic or enveloping to me, maybe due to tweeter response. His room has more reflections than mine as well. I pretty much don't have any first-order reflections except off the front wall which is covered in velvet drapes, and my sofa back if I slouch. He's quite happy with them though, as far as I know. If I were to buy new speakers today, I'd be looking at either the AV123 Onix Reference line or asking James Salk about a Veracity HT3 with higher efficiency (maybe by including a second woofer). And a ribbon tweeter is a requirement for me now. However, I haven't heard any of these speakers or a ribbon tweeter, so I still need to do some of my own listening research. Both of these are outside your price range though. If I were to buy speakers that I feel are equivalent to my Monitor Audio Silver speakers, I'd be looking at the AV123 Onix Rocket line just to save money by going Internet Direct. But I don't feel the Rockets are a significant upgrade from my current system to justify a purchase. Also, this is not based on personal listening and I'm sure they would sound different than my current speakers but would be relatively equal in compromises. The Rockets are in your price range. The two SVSound Plus 12.3 drivers I pre-ordered to upgrade my pair of 16-46PC+ subs arrived today. I've just finished replacing the db12.2 drivers with these new drivers and recalibrating using my Velodyne SMS-1. I found that I could lower the overall gain by maybe one decibel, but that for two of my low-end filters I had to decrease the magnitude of cut by about 2dB. I don't really hear any improvement otherwise. I think the Plus 12.3 drivers are a little heavier than the db12.2 drivers, but otherwise very similar in overall appearance except that the Plus 12.3 driver is black without any logo and has a rubber shell on the outer rim. I also think the Plus 12.3 magnet is a little deeper. I'm hoping I can use the db12.2 drivers for a DIY subwoofer, but I doubt I'll have funds for that anytime soon. So I'd been using the Behringer FBQ2496 to equalize my subwoofers but just got a Velodyne SMS-1 mainly because I thought it would allow filters to be set as low as 5Hz. Turns out that's not the case. Filters can only be set down to 15Hz, which is still better than the 20Hz limit of the FBQ2496, but not as low as I'd have liked. But the measurement system and real-time feedback turned out to be an plus that really made the SMS-1 worth it. The first thing that the SMS-1 allowed me to do was identify the ideal crossover point for my speakers. By adjusting the crossover point and then going back to the SPL graph, I was able to determine that my ideal crossover is at 60Hz. Lower or higher results in a bigger cut at the crossover. I did find the automatic EQ to be less than ideal, mostly because it doesn't bother to move off the standard 1/3 octave frequencies. Instead, I got the best results by manually setting parametric filters at the precise locations. Another benefit is I was able to match the subwoofer volume to the mains volume a lot better. The DMC-1's subwoofer calibration signal is a little messed up. The 1/3 octave smoothing issue mentioned in the Audioholics review is an isssue. I would suggest verifying the response using Room EQ Wizard's signal generator to see if your filters have done anything undesired. But, if you try to make your filters have as high a Q value as possible, you can probably avoid that anyway. Several weeks ago I was patching an anime which had the voices sometimes move into one of the surround speakers as a person moved off screen. When this happened, I immediately noticed a problem. It sounded like those people suddenly moved into a completely different, live, room. And so I decided I needed to put some acoustical panels up to tame the surround speaker acoustics. I was able to go back to California Central Insulation and get some IS300 2.5" semi-rigid fiberglass and then some cotton cloth from the fabric store. And then I started to work on building the acoustical panels. I built a total of eight panels. Four 2'x4' panels for the ceiling, and four 1'x4' panels for the walls near the top of the ceiling where there would be interaction with the speakers. It probably took me about ten or twelve hours to sew the sleeves for the fiberglass and then mount them on the ceiling and walls, but the results have been worth it. Mounting the panels onto the walls was not too difficult. I threaded some steel wire through the sleeves and then hung them off eyebolts I screwed into the walls near the ceiling. However, mounting the panels onto the ceiling was very difficult. I could not run a screw through the fiberglass, as it would just go through the entire thing and then the panel would drop. I couldn't hang the panel from the ceiling because there was nothing to attach a hook or eyebolt into on the panel. So I ended up having to get some transparent plastic wire and screwing four hooks per panel into the ceiling. Then ran the transparent wire between the hooks as a support for the panels. To ensure the panels stayed as close to the ceiling as possible (with some air to serve as a trap), I had to pull the wire extremely tight. Needless to say this was very tiring and hard on my hands. Since there was no one to help me, I often had to use my head or back and stand on the furniture to support the panel as I was pulling the wire. Unfortunately I don't have the disc which originally made me want to do this to test how well that voice would sound now, but so far I've been very pleased with how much better the surround speakers sound. They are slightly less enveloping but I would say in a good way as the sound is more distinct and clear now. It is too bad that my surrounds happen to be bipole speakers (dipole operation possible) which is good for ambient sounds but bad for distinct sounds. The acoustical panels are making the tweeters on the surrounds much less useful. If I have the chance to upgrade my speakers, I will go for direct firing surrounds. Bipole or dipole operation is not as great in my open room anyway. I mentioned earlier that I was having some difficulty with hum between the Emotiva DMC-1 and MPS-1. I tried all the usual ground loop hum tests and solutions I could think of, as well as trying individual channels over balanced XLR. None of this worked, until I tried something a bit more drastic. I removed all of the unbalanced RCA interconnects between the DMC-1 and MPS-1. Then used a single XLR cable to connect only one channel between the two. And there was no hum. So I went and bought a Hosa XLR-803 snake. Using balanced XLR for all the channels has greatly reduced the hum, although it is not completely gone. Swapping amp modules, interconnects, channels, and speakers didn't solve the hum problem. In fact, the hum seems to be a result of interference between amplifier modules, mostly in amp banks 5, 6, and 7, that goes away for a single channel if there is no RCA input to that module, and decreases for a single channel if the neighboring module has its RCA connection removed. Moving to a fully balanced audio path has solved the problem, although the hum is still there. The DMC-1 and MPS-1 support a fully balanced path, according to the manuals, as the balanced and unbalanced stages are kept separate. I purchased the Emotiva DMC-1 and MPS-1 pair on Tuesday of this week, and all of the hardware arrived today, three days later. The DMC-1 is much better than the Yamaha RX-V1400 I was using before as my pre-amp, and the MPS-1 provides twice the power of the Outlaw Audio 7100 in a much nicer chassis. I ran an extended test of Moulin Rouge, which is my reference audio evaluation disc. Unfortunately, I had forgotten to turn back on the subwoofers during this time. However, I was extremely pleased with the audible improvements I heard from my speakers. For starters, sounds were much more distinct. The start and end of any audio was sharper and more clearly defined. Less blurring between sequential sounds. There appears to be better channel separation too (at least what I understand to be channel separation); it was a lot easier to localize audio than before. I also heard more detail from all speakers, which might mean the DMC-1 has a better frequency response from its pre-outs, or might just be a result of no longer having the RX-V1400's parametric equalizer, although that seems counter-intuitive. In short, performance was noticeably improved. I do need to do some more listening with my subwoofers turned on though. The only problem I've got is a hum from the pair. Once the DMC-1 is on, the hum is audible and annoying. I need to figure out how to fix this problem. Over the new year, I visited Shanghai which was my first time in China (excluding Hong Kong). I stayed at my dad's place because he has an apartment/office there, and went because I wanted to visit Luna. Shanghai is a lot like New York City, only more so in the ways I don't like New York City. It is even more crowded, dirtier, and noisier. Buses were frequently packed way past capacity, and no one obeys simple traffic rules like driving in one lane or not running red lights. So it is also pretty dangerous because you can be easily hit by a motorist and people can steal easily on the buses. Despite that, the city planners have done a good job in many ways. There are separate lanes for bicycles and motorcyles in many areas, and raised or subterranean walkways for crossing busy streets. You can also find completely underground strip malls. And the traffic cops are doing their best to enforce good and safe pedestrian and motorist behavior in many places. The biggest problem for me was the extreme cold. Temperatures hovered very close to 0°C or only a few degrees higher for the majority of my stay. I ended up getting sick on Wednesday or Thursday because it was raining heavily at freezing temperatures with strong winds and I got very wet while walking around. Plus, my dad doesn't like to use the heater so even on the 23rd floor when it is so cold outside, he had the bathroom window open and the heater set to 18°C or 20°C in the main room. So I would be really cold when there, and also when sleeping. He only turned up the heat later after I got sick. It was warmer to leave and get on the bus or go to the shopping mall. Food is cheaper there, and of course there is a great variety of authentic Chinese food available. But if you decide to visit one of the new Western chains such as Pizza Hut, KFC, McDonald's, or Burger King the prices are the same as what you'll find in the U.S. (The same goes for any other imported brands of clothing or electronics.) But the menus are very different, and more like restaurants rather than fast food joints. You will find yourself waiting for a table at Pizza Hut, and the menu is Chinese-flavored at all of these places. I did really like the food at Ajisen Ramen though. Coca-Cola and Pepsi have a strange sort of competition going on though, with Coca-Cola clearly spending much more on advertising. Both of them have created "teams" of celebrities to promote their brand, and you can find their faces pasted all over the place individually or as a team with their respective company brand in the background. While I was there, Luna and I visited the TV broadcast tower, which is the 3rd tallest tower in the world or something like that. We also went to the museum which was featuring the paintings of many renaissance artists, but Luna wasn't interested in seeing any paintings. Plus the line was really long. Instead we looked at the gemstones, which she really liked. Shanghai also has a really cool aquarium with lots of different types of fish and other ocean and river life. The introductory exhibits are not that exciting, but later on you go down deep into a really long underwater tunnel so you can see all sorts of animals up close. One thing that I did get a chance to do was visit a HiVi store and listen to a pair of Swans 2.2. These are amazing speakers featuring ribbon arrays for the tweeter and midrange, and four woofers. What I heard was excellent. Unfortunately, no one in Shanghai knows how to sell speakers. The room was acoustically horrible, and the salesmen did not know what they were doing (the DVD player and integrated amp were not configured correctly). The salesmen didn't even turn off the nearby television or close the doors into the rest of the mall. The room was glass walls and a hard floor, although there was a suspended ceiling. The speakers are rear-ported, but were placed way too close to the wall. I finally got around to fixing up the annoyances of my projector mount and hushbox. The mount was causing a problem by being too short to drop the projector below the support beam that cuts across the theater. To fix this, I stuck a 2"x6" between the mount top and the ceiling. It doesn't look great, but I can cover with some black felt to fix that. The other problem was the small rectangular hole in the hushbox acrylic glass. It was too small and blocking some of the light. So I purchased a 5" hole-saw and enlarged the hole, using water again to keep the temperature down. Although I did overdrive the drill motor. I also took the time to level the projector using the mount. The end result is a much nicer picture. I bought a used sewing machine today. I should have done that in the first place, instead of buying the cheaply-constructed Handy Stitch. I opened the Handy Stitch after the motor burned out, and saw it is a simple arrangement of plastic gears and a cheap motor. That machine is fine for extremely small jobs that just need to be fixed up temporarily. But this sewing machine is simply so much better. It produces quality stitches very quickly. Using it, I was able to finish the black polyester ceiling for my home theater. Now the light reflected off the screen does not bounce off of the white ceiling. The polyester does reflect some of the light, unlike my velvet side curtains, but it is better than the white ceiling. I hope it stays up though; the cloth is pulled pretty tight and there is a fair amount of stress being placed on the closet poles. I assume it should be okay, since the strain is probably very similar to what would be there due to lots of clothes. Only my poles are 100" long without a center support. I received the media tower I ordered today. Hard work assembling it, but it looks pretty good. It will hold 587 DVDs, so I am set for a good while on space. I had completely run out of space on the racks I was using for my CDs and DVDs. I'm still using that primary rack for my CDs, and I've moved the other display-type rack upstairs, to join the display-type rack I moved up previously. One of the things that has been bothering me about my current setup is the white ceiling and ceiling fan, right above the projection screen. The reflections can be distracting, especially as the bottom of the fan is several inches drop from the ceiling. So I removed the ceiling fan on Saturday, and bought some fabric and closet poles. I'm going to try and drape black fabric across the ceiling. Unfortunately, the motor in my Handy Stitch burned out while sewing the fabric. I opened it up and it's just a basic gear system using a small motor. So I took one of the motors from Shannon & Yvonne that they were using for their motor boats and am going to try and fix the Handy Stitch. Just need to solder and it should be good as new. I have been having lots of problems keeping my cables attached to the walls and ceiling without falling down. I did use some double-sided adhesive before, which works great until you want to remove the cable. Then it rips off some of the drywall, and needs to get painted over again. I've been using white duct tape instead, but it tends to lose adhesive fairly easily and then the cable will fall off. So today I went and bought some cable staples and cable tie-downs. The staples nail into the wall and the tie-downs are attached using screws or nails. Works perfectly. I don't have to worry about the cables falling anymore. And if I cover it up with white duct tape, it looks as inconspicuous as before. I stopped by Good Guys today and picked up another pair of OmniMount 20.0 Ceiling speaker mounts, for my rear surround speakers. I pulled them out 18" from the back wall and they are now suspended about 6" inches lower. The sound is much clearer coming out of them now. A significant improvement. I've also got all the surrounds pointed directly at my primary listening position now, instead of mostly parallel to the ground plane. I discovered yesterday that the acrylic front to my hushbox was creating a ghost image, due to the index of refraction and slightly imperfect positioning. Unless the incoming light is exactly perpendicular to the surface of the acrylic, a ghost image would be created. Since I cannot perfect the position, I decided to cut out a hole. I used a circular saw to cut out a rectangular hold in the acrylic. It's not very pretty, but it works. I finished building my hushbox and it looks and works pretty well. The acrylic plastic is held onto the front using some construction brackets I spray-painted black. By applying pressure onto the plastic when screwing in the brackets, I was able to get the plastic pushed tight against the frame, to minimize any air leakage between the plastic and the frame. Unfortunately, the plastic makes the front heavy, so I added a couple more brackets into the rear interior to hold a large block of mass. I used the push block we used to install the wood floor as the mass. Photos are up in my gallery. I started building a hushbox for my projector today. I am using 1/2" plywood for the base and sides, 1/4" plywood for the top, and 1/4" acrylic plastic for the front. The inside will be lined with 1 1/2" insulating foam. I'm letting the foam stick out a little bit in back so I am less likely to bump my head on the wood. Plus, if the hushbox does get knocked, the foam should protect the projector. I used liquid nails for the initial construction, but need to add some metal bracing to make sure it stays in one piece. I'm going to try and cover the outside with black felt so it doesn't look too bad. The finished unit will hang off the projector mount; I just hope it isn't too heavy. I received my replacement 16-46PC+ today, and set it up exactly as the one I sent back to them. This one is indeed moving an amount of air equal to the one I kept from the original pair, and it is working great. The guys at SVS have been absolutely great throughout this, and I can't thank them enough. I have an old iBook Special Edition that I bought back at the end of 2000, and I'm currently using it as my music console in the home theater. I was running Mac OS 10.3 on it but 10.3 was slower than 10.2. So I downgraded to 10.2. Unfortunately, support for AirPort Express streaming music was added in 10.3. So I decided to try loading Mac OS 10.4 on it and it is actually faster than 10.3 and 10.2. Apple continues to make me happy. When I received my new 16-46PC+ subwoofers, I noticed that one of them was not moving as much air out of the top ports as the other. The difference in air flow was very large; placing my hand over the port of one would create a loud chuffing sound, while doing the same over the other would have no effect. However, he generated SPL levels appeared to be the same for equal gain settings. Anyway, SVS has decided that the best thing to do is exchange the one that is not moving as much air so they can figure out what is wrong. A replacement 16-46PC+ is on its way to me now. I sold off some of my home theater components, now that I purchased newer and better things. The first was the Monster Cable MonsterBass™ 400 subwoofer cable I was using with the Velodyne SPL-1200II. The second was my JVC XV-SA602SL region-free DVD player. And the last was the Alesis DEQ830 I had only recently purchased. I moved the Velodyne upstairs after receiving my new 16-46PC+ subwoofers, and when ordering subwoofer cables from Blue Jeans Cable I ordered a replacement one for the Velodyne. So I sold off the MonsterBass 400. The JVC XV-SA602SL was of course replaced by the OPPO Digital OPDV971H. That JVC model is currently selling for $100 refurbished online region 1 only. I sold mine for less than that, so the purchaser got a real good deal. And I finally decided to sell the Alesis DEQ830, because while I did like having thirty bands of 1/3-octave EQ, I felt the benefit was outweighed by the raised noise floor and ground loop hum. Especially since my Yamaha RX-V1400 provides seven bands of 1/3-octave EQ. As a side-effect, I returned the Hosa interconnects I purchased, and am using RCA-brand interconnects instead. I only had six of those, so I'm actually using one of the RCA-brand component video cables for the center channel, now that I'm using DVI for the video. Interestingly enough, the noise floor with these cables is lower than when I had nothing on the Outlaw Audio 7100 inputs. I just received a pair of SVS 16-46PC+ subwoofers. These two are replacing a single Velodyne SPL-1200II subwoofer. The Velodyne is going upstairs into the video game setup to be coupled with a pair of Castle Avon speakers. The two 16-46PC+ subwoofers are together in the same price range as the single Velodyne. But they perform at least an order of magnitude better. The 16-46PC+s are extremely large. 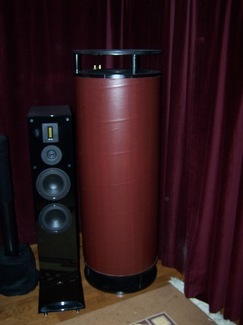 Each subwoofer is approximately 17" in diameter and 4' tall. The basic construction is a single cylinder with a down-firing 12" driver at the base, and three flared ports at the top that are tubes down the length of the cylinder. The driver is protected at the bottom by a solid base, which also serves to make sure the sound is produced correctly regardless of your floor material. They are covered in a very nice black cloth, and the construction appears excellent. The top ports are protected by a nice metal grille that fits snug, but can be removed to plug one of the ports to tune the subwoofer at 12Hz. At the base is the SVS logo. The back of the integrated amplifier contains all of the inputs, outputs, and dials you might want. Some nice features include full-range phase control and auto-on. There are both line-level outputs and speaker binding posts if you need them. SVS packages their subwoofers nicely, using stiff styrofoam, and the entire unit is protected from the elements and dirt during transit by a sealed bag. The bag is reusable. You will want to save the boxes, but of course the boxes are huge. I had to rearrange some things to fit them into my closet. I have them tuned at 12Hz, and removing the top grille is easy once you realize that is what you're supposed to do to access the ports. The port plugs fit very tightly in the ports with moderate compression, so they are doing their job right. During calibration, I discovered just how impressive subsonics can be. I was playing 10Hz through these subwoofers, feeling it come out, and hearing the house respond. I've discovered new things in the room that will rattle, including the sliding glass door to the backyard. I also discovered that I have been missing out on these frequencies in some of the audio CDs I have. One such CD is Bible of Dreams by Juno Reactor. I am extremely pleased with these new subwoofers. The impulse response played back during my calibration seemed perfect. The Velodyne did not recover as quickly from this same impulse response. While playing sources with low frequenices, I am not hearing any harmonics that I don't think should be there. On a side note, I also had a very nice experience with UPS when my packages were accidentally delivered to Ultimate Control this morning. The customer representative, delivery center, and driver were very friendly and helpful. I bought a new DVD player yesterday, the OPPO Digital OPDV971H. This player scored 94 on the DVD Benchmark, second only to the Denon DVD-5910. But the 5910 is over fifteen times the price. After hooking up the OPDV971H to my Hitachi PJTX100 via a DVI-D cable, I calibrated the picture and watched the Avia reference videos. The picture was a step-up, much like going from S-Video to component. I also tested the player's audio side with a DVD-Audio copy of In Blue from The Corrs. The audio was just as excellent as the video. The OPDV971H allowed me to get an excellent level of sharpness. I was unable to reduce the sharpness enough on my previous player, the JVC XV-SA602SL. The edging on diagonals is much smoother. And the de-interlacing and upscaling to 720p features allow me to send a native image to my PJTX100. The unit was packaged extremely well, and enclosed in a fabric bag. The front is slim, stylish, and minimalist. The LCD display is very clear and displays feedback for any button pressed on the remote. The back is well laid-out, all connections are clearly labeled, and there was absolutely no flexing as I pushed cables into it. The remote is just as slim as the player and has a brushed metal face. There is a remote button for just about every function the player provides. And the player provides an excellent number of features. More features than I would expect from any player at any price. I actually picked up the player by driving to OPPO's office in Mountain View. This let me save on shipping, not have to wait for a delivery at home, and also to get the player right away. I spoke there with Sally Li, about the player, their products, and why I decided to purchase their DVD player. She was very friendly and helpful, and that was also a nice side-benefit of picking up the player in-person. OPPO is very responsive to feedback, and my interaction with Sally only made that even more clear to me. I also asked them about the lack of support for 2-2 cadence, as tested by Kris for the benchmark. The other guy there informed me that the 2-2 cadence flag only applies to certain older PAL sources that have been converted to DVD. So I don't have to worry about it for watching NTSC 30fps video sources. I mentioned earlier how adding the Outlaw Audio 7100 and Alesis DEQ830 introduced some hum. Well, today I grounded all the component chassis to each other and the wall using 12-gauge wire, and replaced the flimsy Pyle 1/4" Male to RCA Male interconnects with some Hosa CSS-800 snakes which seem better constructed. The ground loop hum is reduced but not completely gone, and the sound seems clearer and more distinct now. I went over to Bryant's house yesterday after work to calibrate his new home theater setup. He just ordered some new equipment: an Onkyo TX-SR502 receiver, Hsu VT-12 6-speaker system, and a Hsu STF-2 subwoofer. We spent about four hours calibrating his audio and video. His room has a pretty big peak in subwoofer output (or dip everywhere else, depending on how you look at it) at the mid-bass range. It also has a big dip around 70Hz. I think the 70Hz dip is due to the room. His bass response may also be compromised by placement on the thick carpeting. The remainder of the 1/6 octave test tones played decent with a few peaks and dips. The VT-12 sounds great for such an inexpensive system with satellites. The satellites can't compete at full-range, but for the price they sound a lot better than other satellites. The subwoofer is also very nice. We also calibrated the video on his Samsung TX-P3075WH television. The basic settings were easy to set, however there were a couple of issues. First, when turning the set off and then on, it seems to switch off of the custom settings and back to dynamic. Second, there is some visible bending of the picture in one corner, which I was unable to correct from the service menu. Fixing one corner would bend the other corner. I received the color-correcting 40-percent red filter for my Hitachi PJTX100 projector. I ordered this filter based on a review by John E. Johnson and Steve Smallcombe. I adjusted the gain values on the projector to match those identifed in the review with this specific filter. The goal of the filter is to improve color balance across all IRE levels. I can see the picture is slightly different. I suppose the new picture is more accurate, but I have become more familiar with the previous picture. I found a program called ToneGen today that lets you create a few different types of audio tones and custom frequencies. I generated some tones and burned them to a CD to test my subwoofer placement. Turns out my placement was pretty bad for the 20Hz range. I had a significant dip there. So I placed my subwoofer in the primary listening seat and used my Radio Shack Digital-Display Sound-Level Meter to identify a better location on the inside of the left main speaker. This fixed the 20Hz range dip, but I still have a major 80Hz dip. I'm going to perform some additional testing with new 1/6 octave tones I just generated. To find out the proper frequencies in terms of octave fractions, I used the standard octave bands information from Prosig. I have sixty-six 1/6 octave tones starting at 10Hz to 20kHz at thirty seconds each. Should make for a good test CD. I've taken some photos my my DIY screen and the ceiling mounted Hitachi PJTX100. The photos are in the Home Theater gallery. Unfortunately, I do not have any photos of the screen construction. I also updated the thumbnails for the riser construction gallery. The other day, I finished sewing blackout curtains for three windows and the sliding glass door in the area surrounding the home theater. The cloth was about $6/yd. at Hancock Fabrics and I spent about $50 total purchasing all of the cloth and white thread. I also had to buy Because there was so much sewing to do, I bought a Handy Stitch. This made it a lot easier to sew the curtains. Now the projector is usable during the day. I built a stand for my center speaker today. The top and bottom are 8" square cuts of 1/2" plywood, connected together with a 4"x4" piece of wood (actually one of the legs I used to raise the sofa before). To increase the mass, an 8" cube cinder block was put around the 4"x4" before screwing on the top plate. The entire structure is covered in black felt and there are some plastic floor protectors on the bottom. The speaker is placed on top vertically. Right now, I have a bunch of shims stuck on the bottom to make it level and to tilt the speaker up towards the viewers. This should reduce reflections from the screen off the top of the speaker. If it turns out there aren't reflections, or the speaker is unstable this way, then I'll move it back to level. I could place black felt on the top to reduce reflections instead of tilting it. Since I moved the Panasonic PT-50LC13 into my bedroom along with my GameCube and Playstation 2, I haven't had anything hooked up as I was waiting for the Sony STR-DE597. It arrived earlier this week and I was able to get it hooked up today with my Castle Avon speakers. The system works as good as I expected, and does everything I need it to do. There were a few things I found inferior with this receiver, but nothing I wouldn't expect for such a low-end product. Attaching the connections to the back of the receiver caused the back-plate to bend in. It's attached very well, but not very stiff. The unit is not particularly heavy, although the side with the power supply and amplifiers is heavier, making the unit off-balance in terms of weight. It is also pretty large for a such a low-end unit. The inputs labeled DVD only accept coaxial digital audio, and not optical. This isn't entirely bad, as the receiver still includes two optical digital audio inputs: one for SACD/CD and one for Video 2. So instead of having both coaxial and optical audio inputs for DVD, which would only allow you to use one of the two inputs, I could make use of both of them. However, I won't be, as I have the GameCube going to the DVD inputs and the Playstation 2 going to the Video 2 inputs so I can use the optical audio. I may use the SACD/CD optical audio input with another Airport Express at some future time. The LCD display is a bit limiting in terms of available pixels, and the user-interface a little confusing as a result. A lot of words need to be abbreviated making the manual a necessary reference. I also tend to dislike units that have a lot of buttons or controls on the front panel, preferring to use the remote or to have those controls hidden behind a faceplate. The included remote is not a universal remote, for obvious reasons at this price point. This means I have to use both the television and receiver remotes to control things. I did discover that the receiver includes three light output settings for its LCD display, which is a very nice bonus. I have it set to the lowest setting so it does not distract as much. Although, due to the size, I was forced to place this on the very bottom of the stand, so it isn't near the screen anyway. I can drive the Castle Avon speakers, which are rated at 8 ohms, at my desired volume level without pushing the receiver too hard. All I need now is a subwoofer, as the Castle Avon can only handle down to about 50Hz before dropping off. The 6" projector ceiling mount extension I ordered arrived today. I attached it to the kit and the projector is at a perfect height now. I was even able to raise the screen a few inches higher, allowing me to improve the front speaker arrangement and making it easier for people in the back row to see over the heads of the first row. I have the projector cables running along the ceiling. The power goes to the back wall where it plugs in beneath the panel trap. I ran the 25' component video cable I purchased from Fry's Electronics along the ceiling next to the speaker cables. After setting all of this up, I did some listening tests. With the projector screen raised, I can try placing the center speaker vertically instead of horizontally. I listened to Suzanne Vega's Solitude Standing in straight and DPLIIx Music modes. Szu-Huey agrees that it sounds better with the center speaker positioned vertically, and she was about 30° off-axis. So, I need to build a 12" or 13" inch vertical speaker stand for the center channel. I'm afraid any I purchase will not be heavy enough to withstand a pounce from the kitties. At this height, the center speaker will be a few inches below the front speakers, and the center tweeter will be several inches below the front tweeters. But that's the best I can do with my setup. Since the projector screen weights I constructed were made out of black ABS piping, the outside of the pipes do reflect light bounced off the projector screen. Not a big deal, but something that distracts every once in a while. So, to reduce the amount of reflection from the screen weights, I sewed some black felt slipcovers today. Placed over the weights, the reflection is greatly reduced. The only problem remaining is the high center of gravity these weights have, making it them someone ineffective. To remedy this, I will buy some 8"x8" cinder blocks to slip over them. Once in place, it will be extremely difficult for the screen to push the stabilizing weights over. I've put up photos of the riser construction in MyPhotos. Three days of work, approximately 1300 pounds completed, total cost about $500 not including auxiliary tools or the leftover carpeting. I finally got the riser rope lighting put in. I purchased 24' of clear rope lighting from Home Depot, along with the clips and a portable dimmer. I had to get some #4 x 3/4" screws because the ones included with the clips were only 1/2" and would not have gone through the riser's carpet into the frame as well. Everything is attached and with the dimmer set about halfway, it works perfectly. Today Everend and I watched the entire Lord of the Rings extended editions in sequence. Took a total of almost 12 hours, due to minor breaks and some technical difficulties. For starters, MPlayer either did not correctly capture the DTS-ES soundtrack, or is incapable of playing it back through the optical output. It only played 2-channel audio, which I matrixed out to 6.1 channels using DPLIIx and Neo:6. I tried both and DPLIIx seemed better. But either way, the matrixed audio didn't sound as good. I don't think it can do a good job on speech, as sometimes it moved between the fronts and the center channel based on the frequency. And since my center is much higher than my front tweeters (and the Monitor Audio Silver LCR is not the best, this movement was audible. On the second disc of The Return of the King, MPlayer dumped a bad audio stream. The sound was attenuated way too much, and full of noise. We switched to the physical disc at that point. MPlayer's playback and video suffered too. Between VOB file changes, MPlayer displayed a green-screen temporarily as it resized the overlay window. This was disrupting. Not as disrupting as having to change the disc, but annoying nonetheless. Plus, there were some scenes where the entire background was posturized. I think I would have noticed this on the physical disc, and it was pretty bad looking. MPlayer also froze the machine at once point. Also, for some reason the screen saver kept popping up even after I'd turned it off. Eventually a combination of fiddling turned it off for good, but that was annoying in the beginning. Using my phone as a remote also proved a little cumbersome. Although the remote functionality did work, my phone went into auto-lock mode after a few seconds and I would have to navigate back to the remote menu. Running down to hit keys on the keyboard proved more convenient, and necessary at times to adjust the screen saver or rearrange the playlist. All-in-all, I wasn't very pleased with the playback features and quality or the technical problems due to MPlayer. If I didn't have to cut out chapters and join the movies together without menus or credits, I could have simply created a disc image of the movie and played it back using Apple's DVD Player (which doesn't have the greatest quality either). For now, I'll have to wait on any sort of DVD jukebox system. The playback software isn't as good as a good DVD player such as a Denon, the audio didn't play back correctly when ripped using MPlayer, and there were too many MPlayer interface issues. I'm not interested in getting a Denon player right now though, because there isn't one with DVI and a zero-second layer-change. I'll find some seats for the riser, and then look at a projector and screen. Then a DVD player if one meets my criteria. Otherwise a 7-channel amp (e.g. Gemstone Audio, Anthem/Statement, ATI). Last would be a pre-amp. I watched The Terminal tonight. Was quite enjoyable. It wasn't what I was expecting; I was thinking romantic comedy. But it really isn't that. Tom Hanks plays a foreigner trapped in a NYC airport (I don't remember if it is LaGuardia or JFK) because of a promise he made. Because he is such an honest and compassionate person, he makes the airport better just by being there. Steven Spielberg did an excellent job directing this movie. There are specific shots that show off his skill. The people were excellent and honest, experienced actors but really wonderful in what they do. And again, Spielberg hired John Williams for the score. Williams is the only movie composer I know of who still does the really traditional character-melodies. Like Peter and the Wolf. All other movie composers score the scene or the film. Williams scores the characters. Oh, and for this movie, I spiked my two front speakers and placed the spikes on moving coasters I purchased from home depot. The speakers seem a little more prone to up-and-down movement now (probably due to the springy nature of the coasters) but I'm wondering if things will sound better. It's too early for me to make any conclusion, especially since I'd never listened to The Terminal before. I completed the riser today, as expected. It looks pretty good considering this is the first time I've ever put down carpet. After finishing the last side of the platform, I created the steps in the same manner as the platform: roofing felt on the bottom where it touches the floor, the rounded lip (only on 3 sides), carpet padding, and then carpet. Ran out of the dining room carpet leftovers, so I used the carpet leftover from covering the wall behind my refrigerator. Different pile but same color. I'll put up pictures soon. Today I continued construction of my riser. I got the top platform complete and placed on the bottom platform, and finished that off. The sand is inside and everything is screwed down. Covered it with carpet padding. Then I took the carpet which used to be in the dining room (I had the workers save it when they put down the hardwood floor) and got it stapled down on three sides. Not the nicest looking job but I didn't want to deal with carpet tacks and my lip is too short for a really clean fold. I should be able to finish tomorrow, but I still haven't found any rope lighting. Today was my first official vacation day. I'm on vacation until next year, since I hadn't taken any vacation days until now. And, today I began construction on the riser. I cut most of the 2x6's and all of the plywood. The lower-layer platform frame has been completed, and the bottom plywood floor attached and covered with roofing felt. The platform is in position, ready for the sand and further construction to take place on top of it. I built the frame in the garage, only to discover that it was way too heavy for me to get inside. So I bought a pair of rolling wheels from Orchard Supply Hardware which made it much easier. I attached the plywood base and roofing felt inside, then flipped it over with Szu-Huey's help. I really need a new power screwdriver. The one I have right now is portable with a rechargeable battery, but that means if I use it too much, I can no longer screw things in even when it is plugged into the wall. I need one that is always plugged into the wall, for projects like this. I ended up placing the philips head bit into the drill that my dad left here and used that to screw everything in. Not the best solution but it works. I sold my Blue Circle MR1200 on AudiogoN. This leaves my home theater in a minor power predicament. Things will have to run off of a power strip/surge protector for a while. I finally figured out how to force 5.1 playback to 6.1 playback out the rear surround channels. There's a separate button on my Yamaha RX-V1400 remote that will allow me to force Dolby Digital EX or DTS ES. This will create a more enveloping surround experience for people who are sitting on the second row of seats, as my speakers are placed and calibrated with my primary seating position in mind. I decided to compare the picture quality and performance of MPlayer against VideoLAN. The results are a little interesting. For starters, MPlayer advanced the film slower than my computer clock. But VLC advanced it faster. Playback side-by-side made this very obvious as the skew grew larger and larger and VLC played back the film faster. Color saturation was higher in VLC, and detail and smoothness was better in MPlayer both with and without post-processing on. Unfortunately, slight tearing is visible in both applications. With both applications running, MPlayer was getting about 70% of the CPU, and VLC about 20%. Once VLC was stopped, MPlayer took the remaining CPU. VLC would peak at about 30% of the CPU. This is a significant difference in processing time. My PowerMac G5 is a dual 2.0GHz with 2GB of RAM. The Lord of the Rings: Return of the King extended edition DVD will be coming out next month. That is the perfect excuse for a LotR marathon. However, the problem with such a marathon is that all three films are on six DVDs. I don't want the marathon to be interrupted by having to get up and change discs. Thus, I need some way to play back all the discs, in order, without pushing any buttons, and without disruptive credits. The solution? Mac OS X on a PowerMac G5, my Sony Ericsson T616, Romeo, and MPlayer OS X. The result is the perfect custom Mac OS X Home Theater PC (HTPC). The first problem is how to get all the DVDs onto my Mac in a format that I can play back. If I just copy the VOB files straight off the disc, no player will be able to do anything with it. Plus, the audio and video won't be in sync. But, thanks to Jon Johansen (a.k.a. DVD Jon) I can read DVD movies from devices and software that the MPAA doesn't want me to, like Linux or the open-source program MPlayer. [Note to the industry: libdvdcss has resulted in me renting movies from Blockbuster, the exercising of my fair use rights, and my purchase of DVDs. So sue me.] Using MPlayer on my Mac and Linux computers, I dumped the non-credit chapters of the movies to disk. This dumps title 1, audio track 2 (DTS ES) into the file lotr_fotr_1.1.1-27.vob. So now I have the capability of getting all three films on my hard disk in a format I can playback using MPlayer. If I put them all into a playlist, they'll play one after the other and it will appear to be a relatively seamless change. But what if I need to control the playback? I don't want to have to get up to use the mouse or keyboard. That's where my bluetooth phone comes in. Bluetooth on my phone lets me sync its contact list and calendar with my Mac wirelessly. But more than that, bluetooth is a general communications protocol. That means I can send arbitrary signals and files between my computer and the phone. I've used bluetooth before to copy photos to and from my phone, but today I would copy some instructions to it. There are two primary choices for Mac OS X bluetooth phone communication. Salling Clicker is a polished piece of shareware that's won a few awards. This is usually the software recommended when people are looking to turn their bluetooth phone into a remote control. The other choice is Romeo, which is an on-again off-again open source project. The only real developer is the author, but that may just be because it works so well in its current state. Anyway, Romeo is a regular Mac OS X application that connects to my T616 using bluetooth. By sending commands back and forth between the phone and Romeo, I can control several different applications, including MPlayer OS X, turning my phone into a regular remote control for my Mac. And I'm done. I just posted a classified for my Blue Circle Music Ring. I purchased an MR1200 back in May and it was a wonderful addition to my home theater, but I need something that can handle more than 1200W. So I'm selling my MR1200 on AudiogoN.